I played around with different cable combos before settling down on this one. Since I tend to prefer front crossings, I would have liked to do that for both. However my desire for some sort of symmetry and my liking for "outwards" twisting meant I had to do front crossing for the left mitt and back crossing for the right mitt. 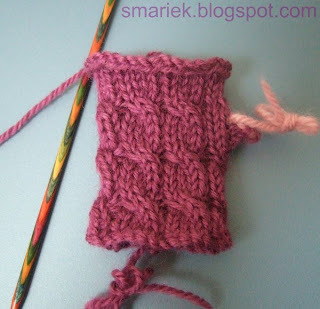 I think I started the first cable round early when I began the mitt, it should be 5 rnds instead of 4. Obviously can't count in dim lighting, lol. I can't quite get the true color to appear, the color is called grape, very nice purple shade. Here's what it looks like when she wears it. It looks almost nonexistent! And that is exactly how she wanted it. I kept asking her whether she wanted more wrist section or more finger section. She said no to both. Don't you think her hand looks a bit exposed in this itty bitty thing??? Missy loved the mitt so much that she insisted on wearing it to bed for today's naptime, it was rather like Michael Jackson with the one glove. I feel like I need to add some bling to her mitt! She tends to nap when DH is around; naps don't happen when it's just the two of us in the house. 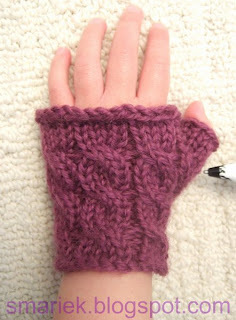 I winged it when I made this mitt. Since she is wearing the mitt right now, I can't refer to it for making its mate! But I am 99% confident that I can reproduce it without having the 1st one in front of me, this one is so simple, it is not rocket science. I do wish I had shorter pointy sticks cuz it is very cumbersome working the few sts for the thumb on these 8 inchers I have. Wonder if they make something around 2.5 to 3 inches? Oh, I just realized that this would be my first project of the year! That's such a cute mitt! And it's perfect. What Missy wants, Missy gets, and then Missy will wear. If it's not the way she wants it, she won't wear it! Better to have a much-loved and worn hand knit than a perfect one in a drawer. What you're looking for are called Glove Needles. The ones I have are made by Skacel. Why is anything made for babies and toddlers so darn cute! I love your cute little fingerless mitten, absolutely gorgeous. 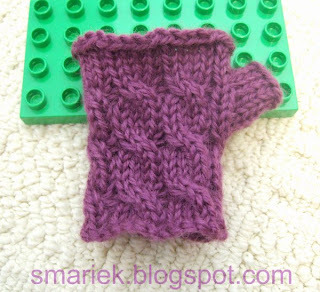 Hmmm, think this would look very cute on my nieces, and could be good practice for thumbs - something I have avoided brilliantly so far. I know this has nothing to do with this post, but I finally figured out the naming scheme for your cable scarves! If you go to xkcd.com and look at the "metric conversions" comic, you'll see how I discovered the pattern. And I'm being cryptic, I know, but oh well... And I love your scarves! I'm knitting Petra and Shadow now, love them! You rock!